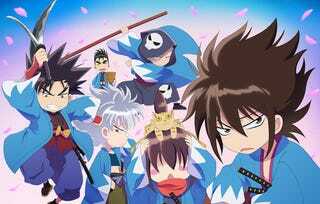 the Spinoff of Chiruran: Shinsengumi Requiem. It ahs been announced via the opening of the website that an Anime adaptation of Chiruran nibun no ichi has been greenlit, previously it has been announced that a Chiruran anime was in the works, although it wasn´t clear if it was the main one (Shinshengumi Requiem) or the Spinoff (this one). The Spinoff follows the everyday lives of the Shinshengumi members, in a Super Deform artstyle. The Anime will premier in January 2017.